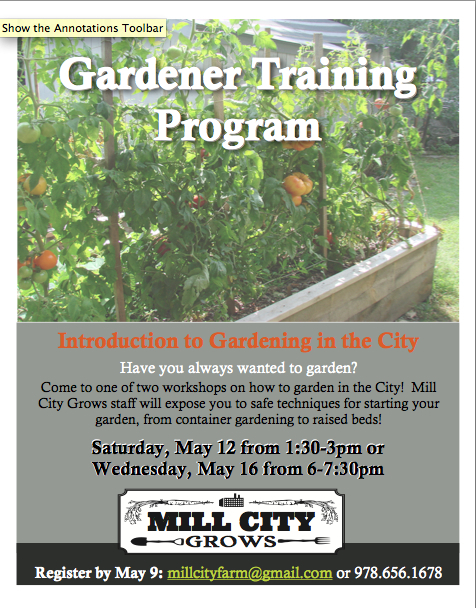 Come to our first Gardener Training Program Workshop! Open to ALL!! This entry was posted on April 27, 2012, in Blog. Bookmark the permalink. The first Gardener Training Program Workshop is open to ALL! Suggested Donation $15, (suggested not mandatory)! All Donations help to support Mill City Grows misson to improve physical health, economic independence and environmental sustainability in Lowell through increased access to land, locally-grown food and education. Scholarships for the Gardener Training Program are available, please inquire we want everyone to participate! « The Latest News from Mill City Grows!